Heroin is an incredibly addictive illegal drug. Dependent heroin users typically exhibit debilitating obsessive drug-seeking behaviors, among other self-destructive habits. 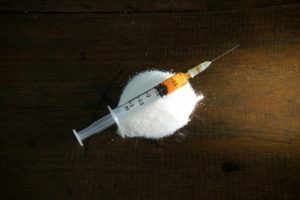 Symptoms of a heroin addict include, though are not limited to hygiene issues, stealing or imprudently borrowing money, change in academic or professional performance, lack of conscience, and general hostility. The physical effects of heroin use can be very serious and sometimes fatal if left untreated. Common physical symptoms include sudden and extreme weight loss, bruises and infections from needle injection, and malnutrition. Heroin abuse can also cause itching, cold sweats, scabs or bruises as a result of picking at the skin, gum inflammation, tooth decay, increased fatigue, and reduced sexual capacity. It has even been linked to muscular weakness, partial paralysis, respiratory illnesses, and coma. Mentally, chronic heroin abuse can cause disorientation, hallucinations, paranoia, anxiety, apathy, mood swings, and high irritability. It has also been known to cause depression, introversion, and decreased intellectual performance. The biggest horror of heroin abuse, however, has to be the terrifying hold that it is able to have on the mind. Heroin forces your brain to release large waves of dopamine, which make you feel incredibly euphoric, but it stunts your brain’s ability to produce dopamine on its own (to put it simply). This means that heroin addicts have a hard time feeling any sort of ‘positive’ feeling without the help of heroin, this is what makes it especially addictive. Despite heroin’s highly addictive properties, and the lifestyle and health dangers that come with it, help is available for those who struggle with heroin addiction. The key for any heroin addict in treatment is patience. Recovery is a process that starts with a desire to get sober, and takes a great deal personal commitment, effort and time. Every addict on the road to recovery faces a variety of unique challenges, but addiction can always be overcome with proper help. Realign Detox is highly dedicated to helping people heal from the physical and mental dependence to heroin. We are one of the premiere detox centers in southern California, where we oversee addicts with a 24-hour team of licensed and experienced clinicians that can oversee the safety of our patients. Our detox services are a mixture of clinical treatment and medication, particularly Nexalin.